While there are many major cities where the warehousing industry is booming, one of the biggest movers and shakers in this regard is the Dallas-Forth Worth region of Texas. There, demand for space and workers is so strong that the entire industry is moving forward at a tremendous clip, a trend that's unlikely to change any time soon. Indeed, industry data suggests that about 175,000 people in the greater D-FW area are currently employed in warehouses or transportation, and over the last four years that number has increased by about 45,000, representing growth of nearly 30 percent, according to CBRE. The good news is that despite these increases, the D-FW region actually has some of the most affordable labor costs for companies in the country, with average wages of about $12.90 per hour in the sector. "Clients are becoming increasingly focused on the availability, cost and sustainability of labor as a part of any site selection project," said Travis Sapaugh, senior vice president of CBRE in Dallas. "As the unemployment rate continues to decline, competition for workers is becoming more and more fierce. An extra dollar per hour in a company's wage rate for a job or a given set of jobs can affect the attraction and retention of a workforce and has real and significant cost impacts to the overall supply chain." Despite the phenomenal growth in the industry already, it seems that there is no lack of extant demand for warehousing space in the region, according to the Dallas Morning News. Currently, about 19 million feet of warehousing is under construction in the region, making this one portion of the industrial construction industry a bigger influencer on work there than the entirety of the commercial construction sector. That 19 million square feet comes in addition to the 17 million square feet that have already been added in the 2018 calendar year, the report said. 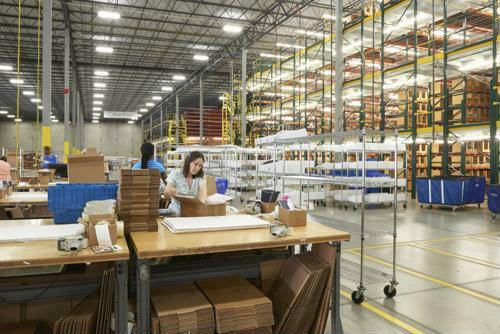 If all continues as planned, it's likely the market will see at least 20 million square feet of warehousing space added for the fourth straight year. And not surprisingly, new leasing activity is also on the rise, ticking up to 5.6 million square feet in the third quarter, up from 5.1 million during the same period a year ago. CBRE found that together with the greater Los Angeles area and Chicago, Dallas helps the three markets collectively comprise about 12 percent of all warehouse and transport jobs in the country. As such, it's no wonder that the data firm also found the D-FW region saw eight of the nation's 100 largest logistics real estate deals in the country during the first half of the year alone, placing it fifth in the country. As long as companies continue to build more warehousing in the region, competition for workers is likely to be quite fierce. As a consequence, companies need to do a better job of making sure they are offering strong benefits and high hourly pay to ensure they can attract and retain top talent.